Oh Zurich is killing me softly... I just booked for another week... soooo tired. My revelation for the week... Chicken biryani looks the same in a Zurich toilet as it does in a US toilet. 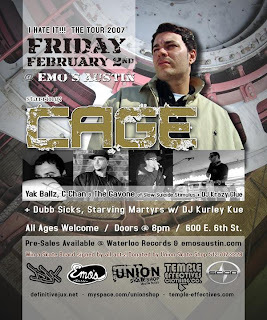 Dubb Sicks @ Emo's Lounge on Friday, Feb 2nd with Cage, Yak Ballz of Weathermen, C-Chan and the Govine, DJ Krazy Glue, Starving Martyrs and DJ Kurley Kue.